Formula 1 returns to Europe for the Spanish Grand Prix this week after Mercedes continued their dominant early-season form in Asia and the Middle East with Lewis Hamilton's victory in China. Nico Rosberg still leads the championship, but Hamilton's Shanghai success means he is just four points behind his team-mate. Ferrari's Fernando Alonso, though, will be hoping home advantage can spur him on to a first win of the season. Hamilton goes for a fourth successive win, Rosberg aims to hold on to the championship lead and last year's Spanish GP winner Alonso hopes to build on a first podium of the season in China. Red Bull will try to ensure Sebastian Vettel fully understands team orders while McLaren will want to pick up points for the first time since Malaysia in March. Felipe Massa, meanwhile, will simply hope his mechanics manage to avoid fitting a wheel on the wrong side of his Williams after his botched pit stop in China. What makes the Spanish GP different? 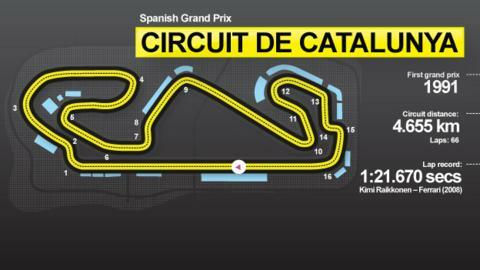 At 730 metres, the run from the start line to the first corner at the Circuit de Catalunya is the longest in Formula 1. The first two sectors are quick with long, sweeping corners which require good downforce and a well-balanced car. The third sector is slower and more technical. Some welcome news for Vettel is the circuit has often been kind to reigning world champions; the driver with the number one on his car has won 11 of the 22 grands prix held here. Plus, the winning driver in Spain has gone on to take the title that season 14 times. With this the first race of the year in Europe, Barcelona is seen as the first big milestone for upgrades from the teams, meaning Red Bull are likely to bring a package they hope can help them pose a greater challenge at the front. Could this race mark the beginning of the end of the Mercedes dominance? The 1994 Spanish Grand Prix will long live in the memory for two reasons. Just two races after the death of three-time world champion Ayrton Senna, his Williams team secured victory thanks to Britain's Damon Hill. And Michael Schumacher finished second despite having spent much of the race in fifth gear, remarkably managing to pull away from pit stops without stalling. The German seven-time world champion was fortunate in that McLaren's Mika Hakkinen, who was right with him, did not have the chance to attack as his engine failed. Schumacher's team-mate JJ Lehto moved into third, but his engine failed, too, allowing McLaren's Martin Brundle to get promoted a place before his transmission failed. That gifted Tyrrell's Mark Blundell the third and final podium place.